Since 1946, the German-American Fulbright Commission has been providing grants for the exchange of German and American students, instructors and professors. This year’s annual meeting took place in Berlin under the motto ‘The Times They Are a-Changin’’ and addressed the question of how social change can be shaped. 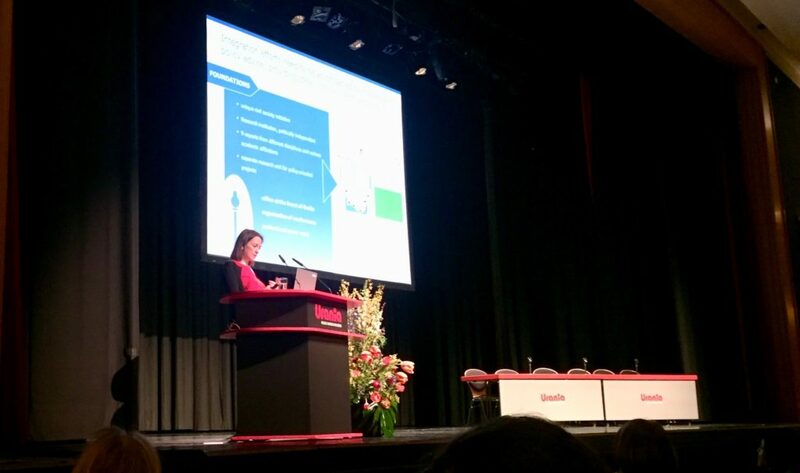 Before about 500 German and US-American fellows, Dr. Cornelia Schu, Managing Director of the German Expert Council, held the keynote address ‘Immigration Country Germany – Current Trends and Future Challenges.’ In her lecture, she discussed among others the European migration dilemma that was revealed during the so-called refugee crisis. As a proposal of the SVR for the sharing of responsibilities within Europe, she presented the regulated free choice model, which provides for conditional rights of free movement for recognised refugees. Prof. Bendel today spoke at a hearing on international migration movements held by the French Economic, Social and Environmental Council (ESEC) in Paris. The invitation to attend came from the German Ambassador to France, Nikolaus Meyer-Landrut. The ESEC is a high-ranking government organisation which advises the French government. At the hearing Prof. Bendel outlined the German system for receiving and integrating refugees and put forward suggestions made by the SVR for developing the Common European Asylum System (CEAS). She was accompanied by Dr Jan Schneider, Head of the SVR’s Research Unit, who also took part in discussions with Council members. Internationally eminent academics, members of civil society, and high-ranking representatives of politics and business met at the Aurora Dialogues Berlin – Millions on The Move: Need for Development and Integration – to talk about the challenges of, and possible solutions for, global migration movements. Dr. Gianni D´Amato of the SVR Expert Council discussed “How Attitudes Influence the Practice of Refugee Integration in Hosting Countries” with Andreas Görgen, Director-General for Culture and Communications of Germany’s Federal Foreign Office, Dr. Lori Wilkinson, Professor of Sociology at the University of Manitoba, and Demetrios G. Papademetriou, President and Co-Founder of the Migration Policy Institute (MPI) in Washington, DC. The event was organized by the Aurora Humanitarian Initiative, the Global Perspectives Initiative, and the Robert Bosch Stiftung, and sponsored by Stiftung Mercator, UNICEF, and United World Colleges. The German-French Integration Council (DFIR) made its first public appearance today. Founded this past May, the DFIR is charged with intensifying exchange and collaboration regarding integration and societal cohesion. Sharing challenges and good practices within the DFIR will mutually benefit Germany and France. The Integration Council is composed of 24 members including SVR Expert Council Chair Dr. Thomas K. Bauer. The DFIR has four co-presidents: the German and French Interior Ministers and the two German-French cooperation delegates. DFIR members include prominent personalities and representatives of a variety of social institutions who are called to serve for three years by the German and French governments. More information regarding this event is found at: www.bmi.bund.de. The Käte Hamburger Kolleg/Centre for Global Cooperation Research and the Friedrich Ebert Stiftung founded a commission to develop scenarios regarding future migration from West Africa to Europe and provide recommendations for national, European, and global policies. The commission is tasked with discussing West African-EU relations within the scope of the Joint Africa-EU Strategy and the formal Roadmap 2014–2017, and considering such challenges as demographic developments and how climate change is affecting West Africa. Among the commission’s African and European members is Dr. Petra Bendel of SVR. Three phases of workshops were scheduled over six months, with the first orientation meeting held in Berlin in late June. At the second gathering in early September in Dakar, Senegal, commission members developed future scenarios. The third meeting in mid-November is dedicated to recommendations for national, European and global policies. Find more information about Käte Hamburger Kolleg/Centre for Global Cooperation Research here. The American Council on Germany invited SVR Managing Director Dr. Cornelia Schu to the United States to present a series of lectures. Events were held in Seattle, San Francisco, Indianapolis, and Atlanta with participants from business, civil society and academia (including the University of California, Berkeley), as well as a school group. Dr. Schu’s presentations about immigration in Germany focused on labor migration and refugee admission. She also presented the results of the SVR 2016 Integration Barometer, a representative survey of some 5,400 people with and without migration backgrounds. The American Council on Germany is a private non-profit organization that works to strengthen German-American relations. You can find more information about the American Council on Germany at: www.acgusa.org. Dr. Schu gave her first lecture in Seattle in cooperation with the World Affairs Council, a non-profit organization that seeks to inform the public about international affairs and engages in critical global issues. A report about the kick-off event, hosted by the Dorsey & Whitney law firm, is at: www.world-affairs.org. 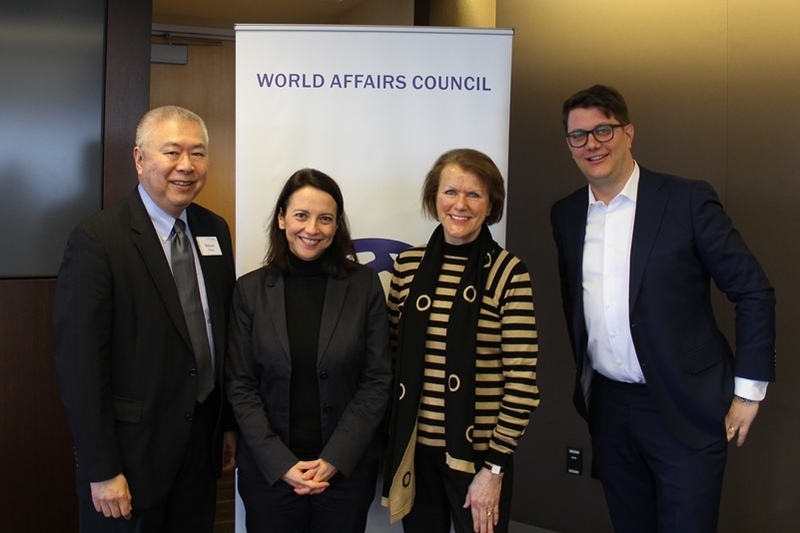 In Seattle: Nelson G. Dong (Dorsey & Whitney), Dr. Cornelia Schu, Petra Walker (Chapter Director des American Council on Germany in Seattle) and Simon Liepold (Fellow des World Affairs Council) (from left to right). European refugee policy and Germany’s experiences with integration are being followed with interest, also in Asia and Australia: Dr. Holger Kolb, Head of the SVR’s Annual Report Unit, took part in conferences in the Philippines and Australia at the beginning of April at the invitation of the Konrad-Adenauer-Stiftung. He gave a paper entitled “Refugees and Asylum-Seekers in Germany: Prospects and Challenges” at the Policy Conference “Refugees and Migration in Europe and Asia” held in the Philippine capital of Manila on 4-5 April 2016. The conference was organised by the Scalabrini Migration Center and the Konrad-Adenauer-Stiftung. At the conference “New Migrations and the Challenges of Integration in Europe, Australia and New Zealand” (7-8 April 2016) in Canberra, Dr. Kolb held a talk on “Successful Integration without Integration Policies? The Case of Germany”. The conference was also organised by the Konrad-Adenauer-Stiftung; co-organiser was the Australian National University. Entitled “The Refugee Crisis and Civic Integration – Looking Beyond Labour Market Aspects”, the Expert Council of German Foundations on Integration and Migration (SVR), the Canadian Embassy in Berlin and the Forum of Federations have organised a joint expert roundtable. The event took place at the Canadian Embassy in Berlin on 15 March 2016. The public panel discussion focused on how refugees with high chances of becoming permanent residents can be integrated into the polity of liberal-democratic societies. The discussion also looked at what the responsibilities of different levels of government are in this area. An expert roundtable discussed the current influx of refugees and civic integration of these immigrants into federal countries. Gianni d’Amato, Director of the Swiss Forum for Migration and Demography Studies (SFM) and member of the Expert Council was one of the experts who participated in the roundtable. The Forum of Federations is an international organisation based in Canada that aims to strengthen the idea of federalism around the world through international workshops, conferences and publications. In a European appeal to protect refugees, a broad alliance of European academics working in the field of migration has called upon politicians and civil society to take seriously their common responsibility for refugee protection. The signatories include Prof. Christine Langenfeld, Chairwoman of the Expert Council, as well as other current and former members of the Expert Council of German Foundations on Integration and Migration (SVR). The appeal states: “The historical and societal project of the EU as such will be damaged seriously if the fundamental norms of refugee protection are not re-established.” Raising internal border controls is not an alternative for the signatories. They are calling for the standards and provisions of the Common European Asylum System (CEAS) to be put into practice by all EU member states and a system for legal routes to Europe to be created for people seeking protection from war and persecution. They also appeal to the EU member states to share resources and responsibilities, e.g. by joint financing of European reception centres, fair distribution of refugees and increased efforts to fight the causes of people seeking refuge. The appeal was published on 18 February 2016 in several European daily newspapers; in Germany it appeared in the Süddeutsche newspaper. You can find the complete text of the appeal here. Dr. Holger Kolb participated as a panellist in the “Trans-Atlantic Conversation on the Refugee Crisis” being held in Washington on 26 February. This was the kick-off event for a series that aimed to intensify trans-Atlantic dialogue on the refugee crisis – an issue that has been at the top of the agenda in Europe for many months and is now also gaining in importance in the United States. Discussions at the event focused on effective and tailored solutions for dealing with the increased numbers of refugees and the integration of refugees. The event series was hosted by the German Embassy in Washington D.C., the German Marshall Fund and the Bertelsmann Foundation. Chairwoman of the Expert Council Prof. Christine Langenfeld at the Richard C. Holbrooke Forum in Washington D.C.
Prof. Christine Langenfeld, Chairwoman of the Expert Council, attended a high-profile workshop on “The Global Migration Crisis: Its Challenges to the United States, Europe and Global Order”. It focused on the issue of how to deal with the current challenges posed by the record numbers of refugees and displaced people worldwide. Solutions, legislative reforms and potential policies were discussed. The workshop was part of the Richard C. Holbrooke Forum for the Study of Diplomacy and Governance and was organised by the American Academy in Berlin.